The Original Black Widow 18650 Battery, featuring a diameter of 18mm and a length of 65mm, has a 3500mAh large battery capacity with 40A max continuous discharging current. 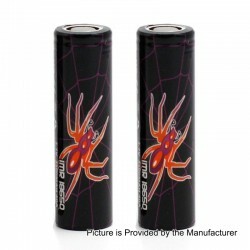 Black Widow battery has excellent safety performance: overcharge, over-discharge, overload and over heat protection. High capacity, low inner resistance, long cycle life, low self-discharge. Strong current charge and discharge capability reached IEC standard. This product comes with 2 PCS in 1 pack.